Joakim Noah–NBA All Star, philanthropist, social activist, and noted free-spirit–signed with the Knicks in June for $18 million a year after spending nine years with the Chicago Bulls. 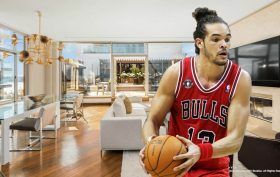 Ahead of his debut season in New York, Noah has scooped up a $5.8 million Chelsea penthouse with an appropriately tricked-out entertaining terrace, reports the Post. The three-bedroom spread at 555 West 23rd Street not only has 2,300 square feet of impeccable indoor space, but the 2,000 square feet of outdoor space boasts a built-in hot tub, gas grill and wet bar, pergola, self-watering planters, and surround sound.